I am not naturally organized by nature. Lots of creative people struggle with this problem. But I function so much better in neat, organized spaces. So keeping my home neat and organized is a matter of pride and self-discipline! There is actually one thing everyone can do that will make a huge difference in our homes…and a difference for the better! Today’s PRACTICALLY SPEAKING is all about this organizing secret! WHEN YOU USE SOMETHING PUT IT AWAY, RIGHT AWAY! Gosh, I know that it is very simple. And you surely know this already. But, there it is! And it is the most sound advice. I have a mother and an aunt that do this like they are breathing. Their home is never cluttered or disorganized and everything in their home has a home! Not only do they put things away, they put them away right. They follow that boy scout rule: leave something better than you found it! This works! 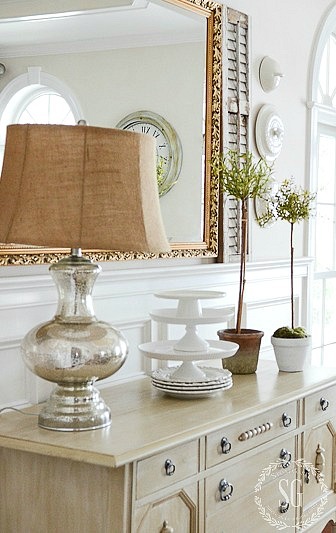 It is the most singular thing you can do to keep an organized and well-ordered home! Yes, it may take up a couple more minutes in your day and cause you a few more steps but in the long run returning things in your home to their proper place will SAVE you tons of time reordering things when they will inevitably get out of hand. I’ve been practicing this technique for a good while now and it’s so nice to not have a pile of something laying around to clutter my home and make me fell disorganized! Other than an organized home, the biggest bonus for me is I am able to find things! No guessing… “where did I have this last”. What an energy and time waster when what you need is not where it’s kept! For those of you who are like my mother and aunt, be so so thankful! But for the rest of us, give this Practically Speaking tip a try… and start right now! Do you have a tip that helps you stay organized? Please share with us! I want to hear from all of you! You might want to follow me on Pinterest and see what I am pinning every day HERE. I love your articles. Your pictures and suggestions are excellent. I once read an article that said that the majority of the items that cause a room to be messy are laying less than 5 feet from where they truly belong. When I am tempted to walk into a room and just put an item anywhere, I think to my self, “It’s only 5 more feet, I can manage 5 more feet.” Just this thought has made a big difference in keeping my home clean and organized. Hi Roberta, the topiaries came from an antique shop. Can you believe they were only $10.00 each? I grabbed them right up. Look for a diy to make them in the spring. The pink flowers are flowering quince and I just love these pretty little buds. I get branches of them every year and force them. They are real. I love this post since I am an organizational nut case. I learned a long time ago the decipline of putting things away immediately. Thankfully, I even have my hubby asking what can go up or downstairs. My other mantra is “touch it once”. This works well with mail and filing. You’ve actually helped me even more with the suggestion of Airtable. I’m using it now to organize everything! 5 finger, 1 step. 5 finger, never leave a room w your hands empty. Going downstairs to put clothes from washer to dryer?…then take the clean dog bowl downstairs while you’re going that direction. 1 touch,,, a spin on your “put it away”. Example, when I come home, hang up my purse then rather than putting it on kitchen chair, then having to move it to hanger when I want to eat supper. I love this article. I wish I could keep my house more organized; in the process of trying to get it organized this week. I have OCD tendencies and it’s hard to live with a hubby that does not have any organizational skills!!!! I’ve always liked being organized but like I said, right now my house is all out of sorts!!!! Thanks again for the article and looking forward to a new year of great decorating ideas and much more from a very talented woman!!!! Never leave a room empty handed. It there its nothing that should be someplace else…your a pro. I try so hard to not clutter but when I buy something for my craft addiction, I don’t always know where to find a home for it so it gets put in my laundry room. This is a real problem. Great ideas as always. Merry Christmas! I agree, however, (and that’s a big however!) my husband and I are retired and unlike a lot of people we know, my husband is a huge “help” around the house. But he never puts things back where they should go. He constantly rearranges my cupboards. To make matters worse he is 6 feet and I’m 4’10”. Half the time when I do find what I’m looking for I can’t reach it! But seriously, he does help me so much and keeping the house “picked up “ is easy. We usually try to make sure that there’s nothing hanging around before we turn in. Takes only minutes and feels so much better in the morning. LOL! Margo I feel your pain, my friend! My husband helps too and I can never find anything! Every night before bedtime, my mother had my sisters and me gather the newspaper, empty the ashtrays, tidy up the house, wash, dry and put away any dishes or glasses we used after dinner. This drove my husband crazy when we first married, but he came to appreciate my tidiness. I’m almost 74 years old and to this day, I cannot go to bed without our house in order! Just my husband and I but we have a hard time with organization. I love the idea though! Since the kids all are gone we have taken retired to the limit! I heard two great tips on the radio regarding children leaving their things all over the place. The first thing is to instill that in very young children–make it an expectation and stick to it. When I was a first grade teacher and I wanted the room picked up, I would say, “when the room is clean, then we will go to recess.” If it wasn’t completely clean, I’d say, “I still see paper on the floor.” You’d better believe they’d scramble to find it. It doesn’t take long for kids to understand what they have to do. 2nd tip–Have a special bucket–call it whatever you want. When they leave something out, the item goes into the bucket and the child has to earn it back. I like that one, too, because I believe that children learn when there is a small consequence attached. When we work outside the home and raise families, it makes our life so much easier if everyone naturally pitches in. Mom isn’t the only one who should help keep order–it’s just too exhausting. I did something similar. I had the “week away shelf”. If a toy was laying around or misused it went on the “week away shelf” My son used to visit his toys there often. an organized house brings me calm! Great tip. The main reason I put things away is I HATE to look for anything. It’s such a waste of time! Love all your information. I also have to be organized in order keep anxiety at bay! You are so right! I find things around the house (Not my stuff, of course?) and I put on them on the stairs to go up to their respective bedrooms. In no time the stairs are completely cluttered with various items the girls have put down and forgotten. Then the clutter is so big that it’s in enormous job to put everything away. Oh, the constant battle for order! Yes, it’s a lament for sure! Always good advice to follow, simplicity!!! Love your simple, sound advice. could you please please tell me where to find the beautiful little green topiary plants in the pots… love your blog so much.! 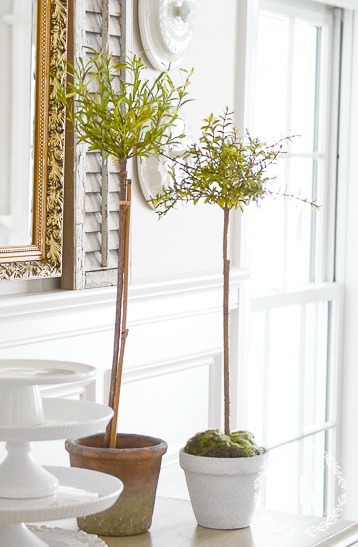 Hi Peggy, the little boxwood balls came from The Pottery Barn a couple years ago. The cachepots came from there too. A place for everything and everything in its place. When there is a lot of clutter have a place in each room that holds the clutter – a place that is needed to relax. E.g. the bed in the bedroom – the sofa in the family room etc. Then put all the clutter on the bed or on the sofa – instantly the room looks less cluttered. Now the only task is to move the clutter off the bed or the sofa into its rightful place. Quick and easy. I was like a pin ball when I tried to clean a room. Bouncing from pile to pile, busy but nothing looked neat. I started cleaning following the hands of a clock. I’d start anywhere in the room and move from “hour to hour”. No back tracking! No jumping ahead. In no time half the room was organized and neat. Common sense–but sometimes it’s good to be reminded! Thanks, Yvonne. like this, very detail oriented.It’s just myself and my husband so it’s not very hard to be organized.Love a neat house. Such practical wisdom. Great reminder. Help with places for things! I am working on this! I am also decluttering as I go. It is so nice to see uncluttered spaces. I read The Lifechanging Magic of Tidying Up by Marie Kondo and I am in the middle of implementing her ideas. Like you, she believes every thing in your home should have a place so that it is easy to put it away. Very good tips today, Yvonne. Thank you. This is so TRUE ! Now if I can just do it every time ! Thank you for the best tip for staying organized. I just need to get there first. Ha! When my children were still in our home and I worked, if I didn’t stay organized I was sunk. The last thing we did before bed time was pick up the house and lay out our clothes for the next day. For my, “zombie” mornings, this helped a lot. Keeping organized is always a problem with me. These are great tips that I need to live by. I call it ‘clean as you go’ and it works, especially in my favorite room of the house, the kitchen! I put away the egg carton, bread bag, coffee can and any other ingredients I took out of the fridge while breakfast is cooking! I empty the dishwasher early in the day so that it always ready to be reloaded. I tidy pantry shelves and kitchen drawers often so nothing builds up! I am a graduate of the ‘a place for everything and everything in its place’ school! It wasn’t always that way, especially while raising three children -and that’s ok- but, there is definitely a calming effect to an organized house! Thanks, Yvonne, for your always helpful tips! I have 1 high schooler still at home and he and I are enjoying a much slower pace for the summer, school will be here soon! 🙂 and a much faster pace will begin :! We forget that our mothers and grandmothers had all these “rules” and sayings for a good reason. Put your stuff away. I’ll be the pit bull in the china shop here. I have been forced to learn that when something is out of place in your home for 3 days it looks like it belongs there and it’s not out of place at all. Try living with a messy hubby and 6 kids. Thank you. Our motto is try to organize the mess. Life is too short to be bothered when you are having fun. 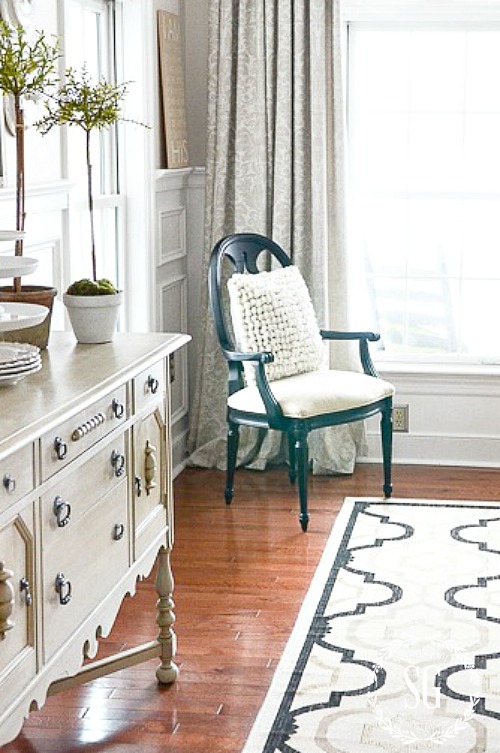 I would like to use 2 ghost chairs in my dining room and 2 Windsor chairs. 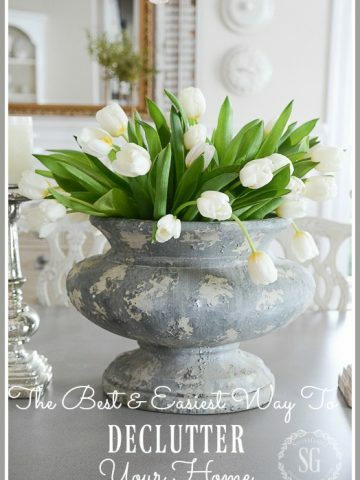 My décor is eclectic, country, farmhouse & cottage. What do you think? Yvonne I couldn’t agree with you more – I follow this golden rule as well although the rest of my family does not. Most of my picking up whenever I find their overflow any where other than their rooms, involves me with a bag per person – collecting their overflow and putting their bagged items in their rooms. Not ideal only because I’m still picking up after others, but better than having others stuff all over. Another Golden rule. I like your basket idea. I think this is one of the best tips ever. Another one is just do it. Now? My hubby has been preaching this to me for almost 35 years. It wasn’t until 2 months ago when he was again reminding me to put the nail clippers back where I found them, that it sunk in! He said he does these things now, so that when we get old, we’ll remember where things are! Light bulb moment for my creative, pea-brain to “get” it! Better late than never! Please, don’t get upset, this tip sounds nice, but is it really practical? If so, please tell me how? Unless you live alone, have a spouse that have the same neatness, and a place for everything and everything in its place, I just don’t see this happening. Every second i find myself picking up, cleaning, removing things and the list goes on and on. I have a husband and now a teenage son that’s never put things back in its place. Never pickup after themselves. Sometimes I just throw my hands up in the air, but I am a clean freak, so I give in and start cleaning. If anyone have the answer how to get everyone in my family to put things back in its place right away, I am all ears. My New Year’s resolution. When I have our home “picked up”, it gives me a great feeling. Great advice and so simple! I feel as I am getting older, I am getting worse at being organized! This can really help me! 2017 is the year I have vowed to make my life easier — for me! A place for everything and everything in its place mentality. Having recently read The Life-Changing Magic of Tidying Up: The Japanese Art of Decluttering and Organizing, I have realized the value of getting organized and getting “like” items together. WHy do I have clothes Upstairs and downstairs? I need to pare down and pick up! And while the “Japanese” method may not be appropriate in American households, I have learned some valuable tips! Excellent post for a new year along with your 8 Things to do before you go to bed! 2017 may just be MY year! Teaching this to my daughter. Do not leave until “later” just do it now. Keeps our home tidy. Thank you for a tip that is do – able! I am finding the older I become, the more ‘simple things’ make such sense and bring such joy. When did we start to think ‘more is more’? When we put things away, we honor, appreciate and value them. … a way of saying ‘Thanks’. for some reason i am wired to “clean up “as i go always have been. still need to organize as i add new things! really enjoy your decorating posts. I do try! Some days are better than others! Always my desire, then why do I let it slip by! If I make a New Years resolution, this will be it. Don’t be hard on yourself Deb. WE all do that! I couldn’t agree more! My family thinks I’m crazy but one thing I do that saves a lot of time in the kitchen is alphabetize my spices. I have a lot of them and can find what I need immediately! Wow !I loved all the posts . I learned over time how to organize, with 8 children it wasn’t easy. I was determined not to hunt for things like my little mom did. I do everythin now. My husband is like the rest a little messy, love him anyway. I guess I was successful , our four girls have clean and organized homes. I’m not perfect just working on it. Love this blog. LOVE your style and your blog! I’m always inspired, and have ‘pinned’ so many of your beautiful ideas! Thank you! My mom was (is) like that, so I am still in rebellion. Ha! But, I do not like a lot of clutter, so still try to stay on top of my messes. Amen! I just have to make a believer out of my husband! Me too Beth! As I’m reading this Bobby is picking up his “stuff” because it’s gotten out of hand! I always look forward to your posts, Yvonne. Thanks for the beautiful photos and the inspiring tips. Great advise. I try to do this and my home is pretty clean and organized but yet I still find myself spending at least 45 minutes on weekends just putting things back. For me my problem is paper, so I try (not too successfully) to throw it out unless it is important. Very true, and I will add to put it away where you found it. I have a place for everything. When someone was visiting me, he would ask for something and I would tell him where to find it. Do you think he ever thought to put it back where he found it? No!!! It was so frustrating. Then I could not find it when I needed it, and he could not remember where he left it. A habit I have acquired! Your blog is full of inspiration, and this is a great post on organization. My mother & husband are like that! Good reminders!!! Loved this blog!! Loved everything about it!! I have a running list of things that I need to do currently and a list of things that I plan to do in the near future. Crossing off an item after it’s been completed is really motivating to me. I am now in my sixties and I have been practicing this method of helping me to stay organized since I was a teenager. People have commented to me my entire life that they are amazed that I get as much done as I do so I definitely think it works for me. I am also a high energy person so that helps! Perfect timing: a shoulder injury has kept me from getting things done as they should. Shoulder better, and today is spent putting away things that have accumulated in a “pile”. Love your blog, always read it when I receive it, no matter what needs to be done! Thank you, there is so much to be learned from you. Great reminder, Yvonne! With my 3 year old it’s all too easy for me to get distracted and not put things away in the moment. I have been trying to make a conscious effort to clean and tidy up before bed (now that he has stopped napping-wahh!) and when we get the mail I pitch and file right then and there. Every little bit of effort helps! I love this simple tip! Things can add up and quickly make a mess. We are prone to that! Love your pics and tips. Thanks to all for the wonderful tips!! So true! A very good reminder! Along with making my bed every morning I now donate an item for every new item I bring home. Trying to eliminate clutter from my life … it’s a slow process. Continuing to work toward a clutter-free home. Great idea to keep it more organized and to keep piles from forming. Thanks! I’ve been reading your blog for years but recently signed up for email updates, so happy I did that! Something I started years ago has worked well to organize our shopping receipts. I purchased an inexpensive,cardboard photo box that matched my room decor (less than $3.00). Using long white envelopes and a sharpie marker I wrote the name of the stores we shop at, (combining some less shopped stores in one), groceries, gas, eating out…etc. I place these length wise in the box standing up. This box sits on a cupboard in the kitchen. We usually file our receipts daily, if we are busy we lay the receipts on top of the envelopes until we have time,( with the lid on they are hidden from view). I also have one envelope just for Christmas of that year. The first week in January I go through the box and discard most of the receipts I don’t need (always keeping the last 2 months of the previous year, home improvement receipts, I keep the Christmas envelope for a few months in case a gift recipient needs it. So many good ideas in the comments to help me get more organized. Thanks so much Jen for your tip! Love the site, just came here because Anita at Cedar Hill Farmhouse mentioned your name in a post on her website. I am the same as you, not naturally organized and organizing is somewhat of a task but needed in order to function. I have followed this tip for years. My husband is not a follower! I love your blog. Cleaning while you go is much easier than tackling a huge job all at once. When I cook, I wash up while I am cooking. It makes the final clean up so much easier. I go through my mail on a daily basis as I receive a lot of catalogues and junk mail. I always file my bills in the appropriate folders for future reference; this makes my life so much easier! This is such a great habit! I put it into practice years ago and now I find I put things away before I’m finished with them and then have to get them out again…like oven mitts. ? YES YES YES! Now if my husband would do the same I would be a happy camper. Such great advice and so true. I am personally pretty good about putting things back where they belong, but my husband is not. The only time I feel like my house is clutter free is when he is traveling for work. Oh well, after 32 years of marriage I guess I will keep him anyway! I like your ideas. I think everything has its place ! I try to put things back, but I never to to put it back “better than it was.” Good idea to keep in mind. I agree with your post 100%. When I get home from from work, I feel calm coming home to a clutter free home! It is hard work, but worth the effort! Great advice here! I try to put things away as soon as I am done with it. Thanks again for sound common sense advise. Your emails are among the few I look forward to every day! Thanks for the wonderful post. Such a simple rule yet it gives big rewards when followed. In trying to cut down on the clutter of unused items at my house, I keep a box in a discreet place. When I run across the piece of clothing that I no longer wear, a household item that isn’t being used or duplicates, books that can be passed on, etc. I place it in the box. Once a month ( sometimes more often) I drop the contents off at a local charity thrift store whose profits go to help those in need in the county. I find that this habit keeps shelves, closets etc neater and the added pleasure of something going to aid someone else. Such a great idea! Thanks! I think I’ll start doing that too! We are always looking for paperwork! It is the worst clutter ever! Time to set up the files! Great post. I am about to re-organize my house. closet by closet. I am taking everything out, taking a hard look, and if I don’t need it, donate it. I am going to start with our cleaning closet. I am going to take everything out, paint it, and organize it. We have vacuflow. I love it, but I am getting tired of lugging the hose around for a quick clean. I have 3 dogs and two leave dust buffaloes everywhere. My girlfriend just bought a Dyson electric broom that you can take it out, do a quick vacuum and put it away. I would be more inclined to do this at least twice a day. Then next is the front hall closet, my mud room which I am repainting and labeling the shelves so it is easy to see what I need to buy. This is where I keep the toilet paper. I have been married to my husband for 40 years. I would buy toilet paper when it is on sale. I would bring it home and then Tom would put it in a different place and not tell me. I think we had about 200 rolls when it finally clicked with me. Now my husband is in charge of the tp. The biggest challenge will be with my pantry. I have pantry moths, which are the bane to my existence. They can get inside of glass jars. If anyone knows how to handle this problem, I would be really appreciative. Thanks Yvonne for all of your tips and for having such a fabulous blog. I get so many ideas from you. Thanks again, I am off to organize. Thanks for the giggle re the 200 rolls of TP, Sue! So funny! And you are right about those moths –I think they can get inside glass jars! Great advice! Not always easy to live up to….but I find if I get off track, I make sure on Saturday anything that hasn’t been put away or attended to gets dealt with. At least this way I start the week off right! Lets face it no matter how much many of us try to stay orangized when we live in a house with others it is hard. So the one thing that works for me is to orangize one area each time I tidy up a room. Ex. I will orangize one or two bedrooms drawers each time I put away the laundry or I may organize the kitchen catch all drawer when I’m waiting for a cake to bake. I do the same with my car. Whatever I take in or pick up, comes out when I get home. Yvonne, what is the finish on your cabinet in the picture? I love the quiet look of it. I live by that rule, put it back when your finished. Saves so much time in a long run. Thank you for all your tips and advise. There are only 2 bloggers I read every day, you and Anita from the French Farmhouse blog. I know you do! I’ve been to your beautiful home… and it’s always perfect! I see a lot of ladies deal with the Mail on a daily basis. I did that for awhile but I stopped doing that. What has worked for us now is to have a pretty basket on the floor by the front door where the mail comes. It goes right in the basket neat and out of the way until we sort it one a week on the kitchen counter. try it …..this has been so much easier and less annoying for us. Perfect timing for this tip. And I agree with Wendy, I need to get the rest of the family on board. My husband is very good about returning things to where he got them from- but he leaves the drawer or cabinet door open till he does, which bugs the neatnick in me, but he claims is very efficient. I am married to one of those fellows who used to drive me crazy with all his books and papers and stuff all over the place. I finally solved that when we moved to the latest home. He has his “man cave” and he can do whatever he wants in there. He just closes the door and I can’t see the mess. The remainder of the home I do my best to keep neat and clean. We are both much happier now. Excellent tip, Yvonne. You are so right! I love to organize closets, drawers, cupboards, etc and I don’t like clutter, but I’m not good at maintaining it. You’ve inspired me to try harder! Thank you ! PS – I’m a creative person and still organized! Growing up my family lived in a small trailer. It wasn’t a mobile home, it was an 8×42 foot long trailer for four people. If the newspaper was strewn about it looked chaotic. I learned to have a place for everything and everything in its place. My mind works better this way but I have been told, I’d be much more creative if I didn’t have the need to be tidy. I’m glad you can be both, Yvonne. I try to remember,touch it ONCE. Don’t lay something down to be picked up yet again to put it in it’s place. Hard not to place on bottom step for later. Great tips! Only wish my husband would cooperate! He leaves things lying around & I am constantly picking up! He says that he can’t find things when I move them! I have a husband that does not follow the “put it away” rule. So I give him grace and put most things away for him. If it gets too bad I put his things in a laundry basket in the master bedroom closet. It’s just part of living with another person! Love the simplicity of your wisdom. I can actually use that saying with my adult children without using too many words–which they would block out! Keep working on me! I do try. Love your site. or least get rid of the old when something new comes in. I too have a creative brain so the house staying organized and everything in it’s place is sometimes hard for me. But I can’t stand to be disorganized at the same time….it makes me crazy and then I can’t function. So I hear exactly what you’re saying Yvonne! Good to hear there are others like me and I’m not alone! I love your blog and always look forward to reading your tips & tricks! Thank you for the organization tip! I would rather paint or alter something than clean house and the older I get the worse I am. Love you newsletter. Thanks for sharing such interesting ideas!!! So good to hear you like the StoneGable newsletter! My mom tells me that when I was a little girl I would organize all my toys and then wouldn’t want anyone to come over and play because they would mess them up! I am still an organized person, but having four boys has taught me to lighten up a little. Such excellent advice! My mother always told me, when I was a kid, to put things back where I found them. and I’ve always remembered that. (Unless, of course, I can find a more efficient place to stow it!) The big advantage, too, is if/when folks come to visit unannounced, our homes look reasonable presentable. Thanks for sharing…I used to be such a neat freak until my husband passed. I need to get back into the habit! Thank for this reminder so easy but we seem to forget it! You are a blessing! I love this piece on organizing!! I have also moved in with my mother (who is a borderline hoarder with the “Waste Not, Want Not” mentality). It is SO hard to stay organized when she tends to just “stuff” things wherever she can find (or make) a spot for things. Then, because I do all the cooking, I go crazy trying to locate just a simple thing like a measuring cup because she “stuffed” it somewhere. Having recently reorganiz4d and purged the kitchen cabinets, I finally have it all organized “my” way… Now, to beat her to the dishwasher so I can put things away is the challenge. Love the post and helpful ideas. Glad I found this one. Great advice. Starting today I am going to take your advice. Amen Amen Amen! SOOOO true! The split second it takes me to put something away the first time is sooooo worth the less clutter I see when my eagle eye scans the room for something out of order. Yes, I’ll admit- it is a sickness. I am trying so hard to stay organized in this 5th wheel while we’re waiting for our new house to be built. Piles of magazine are my downfall – my ‘I’ll read this later” stack that just gets higher and unread. Thanks for the reminder -your blog is always inspirational. You are absolutely right! I’ve been doing this for years now and it surely helps to keep my home well organized….and free of excess clutter. A great reminder to start back doing this! I’ve kinda got slack on that lately. I hope you’re having a great weekend Yvonne! I am pretty good about putting things away when I have finished what I was using them for. However, when I am working on something, like my stamp collection (which has many, many volumes and a huge box of supplies, I hate to put things away every night because I would just have to drag them back out again the next day. I have gotten better about putting each album away once I have finished putting in the applicable stamps, but the rest stays out in my family room most of the time. Unfortunately, the place where I work on my stamps (and other projects) is on the couch in the family room which is clearly visible whenever I open our front door for visitors. Thanks for once again breaking things down to the basics. This is what really world and saves us time and energy in the long run. I too love a clutter free home so I try to abide by “the one touch”rule . I couldn’t agree more! I’ve done this for 22 years of marriage, and my home is really lovely most of the time as a result. Another tip to add is not to collect too much stuff. I keep it paired down by selling or donating items I’m done with. It makes for much less to put away! 🙂 Love your blog– thanks for working so hard Yvonne! My tip? Last thing at night I walk through the ‘visible areas’ of our house and do a quick tidy….throws folded, pillows fluffed, magazines stashed, etc. No deep cleaning, but always looks nice in the morning. In the morning, always! make the bed before leaving the bedroom. Just pull up duvet, fluff pillows. Again, quick, but makes such a difference! Such simple ideas and what great advice. I hear my mother in a lot of these words. Great suggestion. Have been doing for a while and makes life so much easier. Such an easy wonderful plan. Will get organized. Thank you. Love your blog! Here’s my tip: LESS IS MORE. This tip absolutely works. How can something so simple be so challenging?! Thanks for the reminder! Did you know that you CAN teach an old dog new tricks?! One tip: Do not double handle things! So simple. For example: After I use my nail file while I am sitting on the sofa, I do not lay it on the table…for later. While it is still in my hand, I immediately go put it away in the bathroom drawer, it’s home. I can’t function in clutter so I follow the “a place for everything and everything in it’s place in my home. The one place I have the most difficulty is my jewelry workstation, organizing alone is hard, keeping it clutter free is not always possible while creating! Great advice! Now if I could just get my guys to do the same thing…… Thanks for sharing – always love your photographs, too! I usually put things away…but the part about putting them away RIGHT….not always so good about! Something to work towards! Thanks for sharing! Thanks, Yvonne…always look to Stone Gable for seasonal decor projects, and love looking at your home! Great advice. A clean organized home gives me more energy and makes me happy! Thankfully my mom had/has this rule when we were growing up so I don’t even think about it-when I’m finished using something I put immediately put it away. I’ve taught my boys the same thing & for the most part they are pretty good about it. I also take it a step further & do not enter a room without something that belongs in it & don’t leave the room without something that doesn’t(I.e. towels get folded then taken to bathroom then I don’t leave without grabbing laundry basket or trash basket.) Doing these two things helps keep our house fairly clean & tidy even with 3 boys(12,5&4). I am an ‘a place for everything, and everything in it’s place’ kinda girl. My grandmother was a stickler for this and it stuck with me. Now getting my husband and then my boys to adhere to this rule at times proved to be a challenge…. Great advise ! Simple, yet so hard for some to do. My mother taught my sister and me at an early age “A place for everything and everything in its place”. To this day I get nervous when there is clutter around. Not sure if that is a good thing!! Always enjoy your blog. Great advice. Sometimes easier said than done. What a simple idea, yet so difficult. I usually replace things as I go, except the dinner dishes. They usually remain in the sink until the next morning. I need to start a new habit! Yes, I agree, if you take it out put it back! Now to get my husband into this habit. Although, at his age I may resign myself to do it for him! I’ve been trying to teach this to my granddaughters who spend a lot of time at my house. I love that they love to come over but not the mess they leave?. It’s a work in progress! Make the bed upon rising. Rinse the dish and into the dishwasher it goes. After brushing are hand washing dry the sinks. When bringing in mail put it where it belongs immediately. Never open a new bottle of anything without the old one being tossed. Close cabinets, drawers and doors to everything. The door is there for a reason (closet) pantry etc. Love all our helpful hints. Maybe you could send this one to all our husbands!HA! 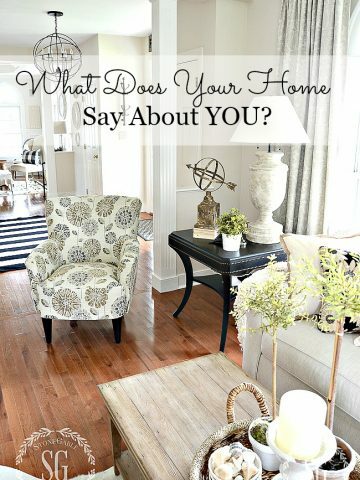 I love just looking at the pics of your beautiful home! The recipes are delicious! ?? 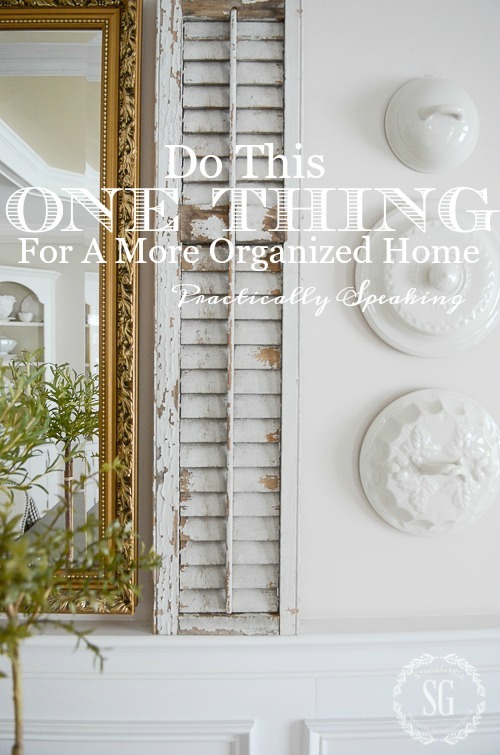 Thanks this is a great post, I love to be organized but I realize I’m kind of irritating to family because I don’t care for clutter. A clean uncluttered house makes me feel peaceful. Great advice. Since we have downsized, it is an absolute must. I have also always put things away after using them. I sure don’t function well if there is clutter around but I need to improve the neatness of my desk. That is the one spot that always seems to use improvement. When I get mail in, I open it in the garage. Junk mail goes into the recycle bin & never comes into the house. I love your blog & always enjoy reading about organizing. So glad I found your blog recently. I do this in the house, but for some reason my mind just can’t seem to “put up” in my studio. I’m doing better than I used to, but I still need improvement. Great post. I love the rosemary Topiaries!!! got any tips for keeping them inside? It’s a perfectly simple idea and one that was and still followed by my 95 year old Mother. So dare I say that sometime the old teenager emerges in my body, and I think this is my home and I can do what I want to do. So after such a strict upbringing I’m actually proud to say that some days I LOVE being unorganized (doesn’t happen often though) . 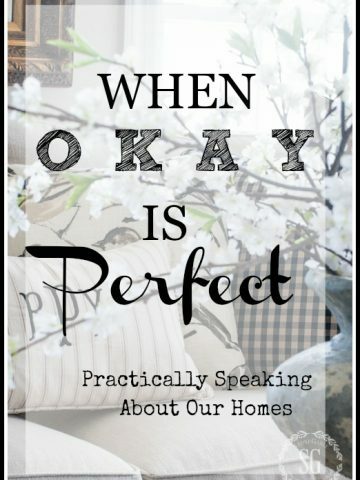 Love your blog and your home is perfect in every way whether or not it is organized. Thanks Yvonne. I too struggle with being organized. Papers are my challenge. I’m also trying to adopt a habit of only handling an item once. When a piece of mail comes in, deal with it immediately i.e. Look at it and decide what needs to be done with it, shred it, into recycle bin, file it to be paid for bills. Putting things away right after uses is one I’m going to work on. I know it will save time money and sanity. I think all of us can use this reminder Yvonne. The other tip I have is to spend just 10 minutes a day decluttering an area. It’s amazing what you can accomplish in 10 minutes. Sometimes, despite my best intentions, my home office is a wreck, I’ll set the timer for 10 minutes and am more than amazed at how cleaned up it can get in that short time! I have been in my new home almost a year and I’ve been using that organizing tip since we moved in. It does help to keep me uncluttered. I am a “neat nut” so I am constantly organizing. I can’t stand it when anything is out of place! Thanks for a great post! This is a great article and a very good idea. I am in the process of cleaning out most areas in our house. As I decide what I am going to keep I am also finding a new place to store it. Hopefully once everything is given a new home it Will be easier to find and I will feel more organized. I agree with this!!!! I grew up in a household where my mom was less than organized, so I’ve had to re learn the way I organize my home. Great advice! Your mom and aunt know their business…think of all the aggravation they saved themselves over the years. Had to pin this to both my Organizing and Cleaning boards. Great article and something I am always working on.. Some days I am successful other days.. well………………. Please Please write an article on how you store all your decor. I am adding pieces just like everyone else but when its time to redecorate what do you do with it all? And how to keep it organized so you know where everything is ? I agree…wish she did a post on storing home decor when not in use. Hard to do but practice makes perfect! This is a great post. I seem to follow my mother and grandmothers advice. As a young lady and newlywed you seem to develop these skills slowly overtime. A system that works for you. It is easy to store items in small to large clear see through containers marked with end labels. Easy to view all at one time and nothing to fall and break from stacking items on a shelf. Of course decorating shelves is to display your beautiful items. I do keep a certain amount of everyday items in small containers with handles and lids to easy access lift and store. I use plastic lightweight open baskets with handles for small items too. lift and store for the next day. To store cosmetics I use everyday, I use clear Lucite containers with lots if compartments for brushes and jars etc. Everything visible and handy stored in the linen closet. I do the same thing with plates, vases, silk flowers, candle sticks, holiday, seasonal, and decorating items, all in clear marked container to view. The clear shoebox sized storage containers with lids are my lifesaver. They are a good size for 90% of items that are stored in closets and can also fit on shelves and in drawers. I find 5 in a package at most big box stores for less than $1 per shoebox. I also use them in the garage to keep things organized and being see-thru keeps you from having to open a box to know what’s inside. And, for those of us with arthritis, they are of a size that even when full, are of a reasonable weight and are safe to get down from a closet shelf or lift from below. And – they stack! I couldn’t live stress-free without them! 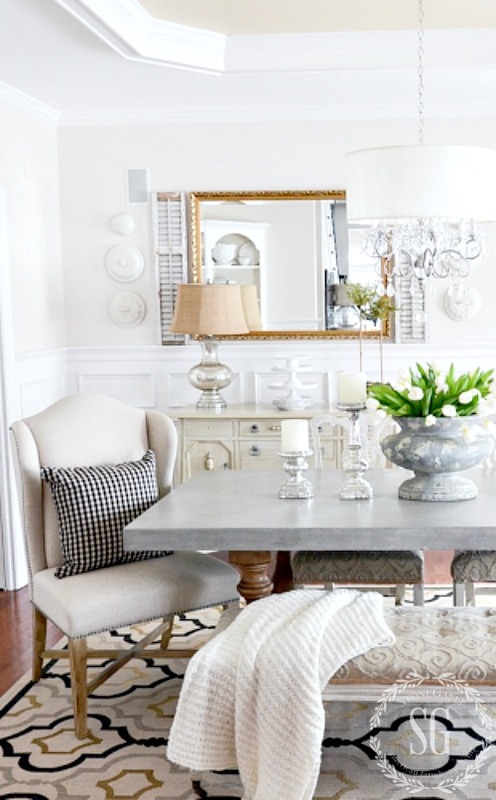 Love the pics of your dining room! The shutters around your mirror are particularly interesting to me. Are they old and repurposed? Where might I find something like that??? My biggest challenge is my closet but I’ve taken on the task of “One thing in…one thing out” and it’s worked quite well. Also every January I go through every piece in my closet and cull out clothing, purses and shoes. It gives me the opportunity to reevaluate everything. I am a 50% er; that is I do that about half the time. I would be more mindful of it if my husband also did it. He is very messy and saves tons of useless papers. After all these years, I think it’s a lost cause. I fall somewhere between naturally organized and a clutterbug! My biggest problem area is paper! Mail, magazines, snippets of paper with ideas, recipes I clip, and so on! I’m inspired to clean up my mess thanks to you Yvonne! We’ll see how that works!!! I hear you, Emily!! Paper is a huge problem for me too even though I have Pinterest, I’m still nervous I might lose a special recipe or idea. Then, there’s all the “other” clippings that I want to keep (perhaps, health related or whatever!!) – it’s very easy to get swamped! Right now, I’m trying to organize hundreds of photographs. Yvonne, you r so right!!!!!! My motto is everything has a place, put it in its place. Do this and u will always have a tidy place. Great tip. I also make a habit of making up my bed every day. I’m not the most organized person either but this helps to look like i am. Going thru the mail everyday instead of letting it pile up is also a habit I’m trying to get into. This eliminates clutter and gives one a sense of accomplishment even tho it only takes a few minutes. So hopefully I can concentrate now on “de littering” every day maybe just starting with one room. Thanks Yvonne- it makes me feel better to know you aren’t an organizer either because your pics sure look like you would be. I’m in good company!! My motto for possessions: Do I LOVE IT? & do I use it? If not I donate it. Schedule time each evening to devote to using a basket or tray to gather up all the stray items & return them to their rightful places. I look around a room & think, if I had unexpected company, would the room look presentable? I try to live by this motto also, but there is always something to pick up! I also have a box in my laundry room where things can be put for people in my family who are not sure where to put them. I go through this box once a week and place things where I want them. I just walked through my house and put all the “strays” away! What a difference. So, so true! The hard part is getting everyone in my house to do the same! great reminder! 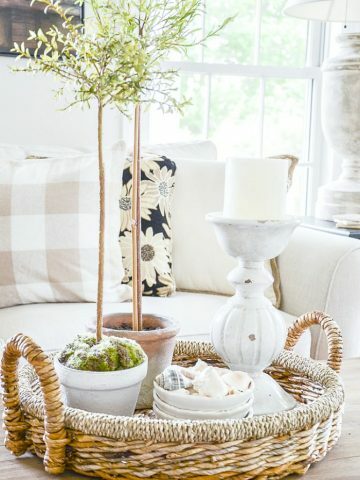 thank you for sharing all your wonderful advice and decor ideas! I will tell you again how much I enjoy your blog. Having things in order is a necessity to me. I am a detail person and anything out of place stands out. It really is pretty simple to just put things away as you use them. Mr. Rogers used to say to the children watching his show, “There are three parts to every activity – the preparation, the activity and the clean-up”. I have actually quoted him to my family more than once through the years. I am the picker-upper in our home. Having down-sized to less than half the living space 18 months ago, I find this is truly a survival skill. Another great tip is with mail management – touch it once! File it, recycle it, shred it – NOW. Not after it has lain on the coffee table for a week or become a tottering “to be filed” pile. A sanity saver! In my opinion, there is nothing that brings a huge smile to my face quite like walking into my home which looks clean and organized! It says “Welcome Home!” with arms opened wide! 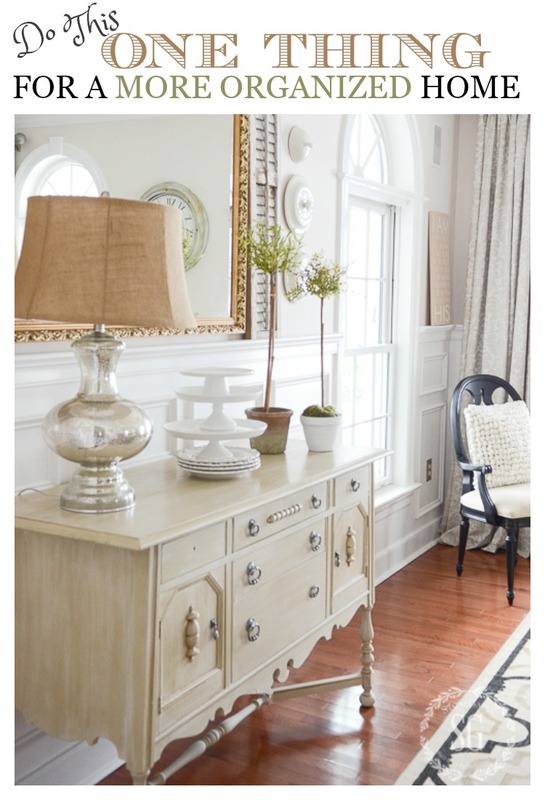 I want my guests to also feel drawn into our home, feeling peace, quieting their soul, & sensing God’s presence. Thank you for sometimes reminding us of tips that may seem obvious but make a huge difference! I’m trying to teach this to my grandkids! So much easier “Said than Done”! I can still remember when I decided to have an organized bedroom – and it drove my mother nuts. She was such a wonderful person but not at all organized. My husband has his little dumping area at the wet bar that I ignore until we are having company, and he actually cleans it up on his own because he knows if I do it he will not be able to find where I put his stuff. Then out again it comes a piece at a time – until it is time to have company over. Well you obviously must have company more often. ? This is such an easy piece of advice but so true! I looooooovvvvvveeeee your new option on your posts when you feature an item that you now attach a link to it so we can order it or a similar item! So often I think how I would enjoy something you post but can’t find something similar. Great advice going to try this today with hopes of keeping it up all the time. Great advice. Wish I were better at this. Excellent advice! I wish my husband would do it too. I like to know where things are when I need them. For years I attributed my clutter tendencies on my creative needs..
A self-inflicted “clear the clutter'” plan ensued and has brought me to the point that my creativity will kick in only after clutter has been cleared! It hasn’t been easy … Clutter can still “happen” and often does, but knowing that creativity will follow clutter-clearing is assuring! It’s never too late…I’m in my 70’s! Ditto with the donation bag, keep the purge constant. It helps to get everyone on board. I live with a Less Is More husband and after a while, it rubs off on you. Words to live by! A good back-up plan is a five minute (set the timer) “clean sweep” before lights out. The reward of starting the day sans chaos is addicting. This tip is spot on! Thanks! My mother always taught me to put things away as you go along when cooking and I find the rule applies to all activities whether cooking, working in the garden or just returning to the house after grocery shopping. Leaving my counters clean and no dirty dishes in the sink makecs getting up in the morning so much more pleasant. Also being organized saves so much time. No hunting for things if they are always in their righ place. Now I have to work on not having so many things. I have started my seasonal purge and since I volunteer at our church thrift store I have no excuse not to bring a bag of donations each time I work. That is the right place for them!! I totally agree with you – although I don’t always do it! Since I have a bunch of baskets and trays in my office I tend to throw stuff in them with plans to go through them later. Well, by the time “later” comes, I have a huge project! Thanks for the reminder and enjoy your weekend! I am a naturally wired organized gal. It’s easier for people like me because it feels less like work. But the hubby is an adult ADD guy so while he really tries it’s a constant struggle, I’ve learned to give him grace. Our daughter is organized in her own home as much as possible raising a family w/a VERY messy hubby. Our son…total slob! ? but he too feels distracted unless he picks up his apt every week or so. Guess I’m saying we are al made differently. Tips-a shelf in my closet for purse, jewelry, papers, etc that I’m too tired to put away upon returning home like a staging area. A hook in there to hang Sunday clothes the day before complete w/shoes and jewelry. Two compotes on my desk for and inbox and a to-be-filled box. Keep clipped coupons in my car. I always buy a very deep kitchen sink because my family doesn’t know we have a dishwasher! LOL at least dirty dishes are not seen. Every morning I do a 15-30 min sweep of the public rooms after I make my bed. One daily load of laundry per day except Sunday, ALL the way thru. Wash, dry, fold, put away. Try to group all my errands on a single day. And I like to get up to a clean kitchen with no counter crumbs! Pamela, thanks for your ideas. I too live with a husband who is challenged when it comes to order. He just cannot see themes (as in this is where all my socks are, so my belts do not belong there etc. ) It used to irritate me but now I changed the way I look at the issue. He is an amazing man overall so I am glad he has his faults. It makes him more human. I see his messes as him marking his territory. Not like a dog. Haha! More like an explorer bringing proof that he has been there. Oh, and separate closets is a marriage saver. Great advice, Im trying to get more organized. One room at a time. Great advice. Something we know we should do, now just do it! I am a naturally organized person. My husband and all of my children are creative. LOL. I am also somewhat creative, but I find my desire for everything to be put away interferes with my creativity. When I sew, it must be finished in one sitting – this means all projects must be completed in less than one day, preferably in a couple of hours. I have wondered if having a dedicated sewing room would make a difference…that way I could have an ongoing project laid out. Maybe some day! My tip is on staying organized involves the family. Some people won’t agree with me and that’s fine, but since I’m the one who is bothered by things being out of place, I just put them away. If it gets where others have made a mess that overwhelms me, then I have them help. My husband and my one son who still lives at home, cannot seem to find anything of theirs, even when they put things away – they just can’t remember where they’ve put them. I don’t know how, but usually I know where they’re at…perhaps I see things when putting other things away. I don’t want them to stop being the creative people God made them to be – I’m fascinated by them and the things they do so well. Here’s another tip that I wish I followed more! Always have a second look AFTER you think you have it all cleaned up! I don’t know how many times I have thought I have put everything away, and finished all the small details, and been ready to walk away to another area or project, and then just glanced back, and realized I left the most obvious of things ,out in the most obvious of places! That glance AFTER you think you have finished, can make the difference in a tidy up feeling done compared to a tidy up ACTUALLY being done! The glance after- I like that. That’s what I do when I’m leaving anywhere public- glance back to make sure I didn’t leave anything. Should do it at home, too! When our children were growing up it seemed very hard to have an organized home, but now that they have grown up and they have their own homes.our home is much more organized. Thanks for the advice and good post,I will past your good advice to my three children.? I’ve done this my entire life, it really is a big stress reliever!! My hint tag teams with yours…..put ALL of it away. I live w a dear one who thinks he puts it away like when he makes a sandwich, he puts the cold cuts in refrig and bread into the basket, but the knife is left on counter. Or when you come home from a trip and dump dirty clothes into hamper but leave suitcase in middle of the bedroom. Put everything away after use. That is the best advice! One thing I struggle with is magazines and mail. When I picked up the mail, junk immediately goes into the recycle bin, bills by the computer on the desk where I pay them online, and I will keep a small stack of magazines on my nightstand until I can get to read them. Some of my beautiful cover magazines that match the season I will put a few on my coffee table. Laundry is another constant battle, but I try to keep up with that too. Thank you for the tips! Wonderful post – I try to follow this rule but sometimes get lazy – don’t we all! Well said and I wish I could achieve it in my home…but I do not live alone, thankfully! I have long had a mantra ” a place for everything and everything in its place”…the same tip with different wording. Just getting my husband on board is a challenge…why put it away when I will need it tomorrow?!! I will keep at it and maybe one day achieve my zen like home! I am like your Mom and Aunt, I do not like clutter. My tip is to go through the mail daily and immediately dispose of/recycle all the junk mail. Keep all the bills in one drawer or folder to follow up on later and all magazines and newspapers go in a magazine racks on either side of my husband’s and my chairs. He has his favorites and I have mine. Then we switch reading material. Works for us. Love that and if I could get my family on board! We waste so much time and energy searching for things! You’re spot on! Good advice! My mother always said “a place for everything and everything in its place.” Living by this rule is easier then looking for an item. Love your blog. I also have a small condo, and it takes constant reorganizing. I also paint, use a cutting machine and do craft shows…so a constant fight to have me win and not the stuff! Have always said the same thing too while raising my kids! It works. Well stated!! I have just moved..yesterday was the last haul to our new home. Clutter and lost items were a daily struggle in our lives. So this post could not be more timely. I am committed to everything starting out with a proper home ..it’s my chance for a reset!! Now I pactice this and teach this skill to my kids, too!! Involving them in this new way of living in our new home is essential to our success! Thank for this solid advice!! You always come through for me!! I use a mantra that I learned training horses: “Take the time it takes, and it will take less time.” I appreciate so much when others follow through. It makes things easier for everyone. Wow, Ardelle what a great mantra. I think I’ll adopt it! Thanks! Haha, Joyce, that is what I do,too! No messy spoon rests on my stove or counters either! I love this idea! I too will be doing this from now on…..thanks for the tip Joyce! Wicked awesome as we say in Boston. Oh Joyce! I thought I was a pretty smart time saving neat freak, but girl, you just taught me something new! Brilliant! I just have one question- do you find average people think you are nuts? They just don’t understand how our brains think! I think it’s brilliant, of course, because I do the spoon thing also. I hate a mess at my stove and that includes the messy spoon rest. They are just something else to clean. Thank you Joyce for sharing, such a smart idea. I will be doing this from now on! Thanks me too! Great idea! Great advice ! Now to get the rest of the family to follow suit! ? Someone once told me, “It’s just as easy to put something in the right place as it is to put it in the wrong place”! I remember this whenever I’m tempted to put something down in a random place. Wow, whoever told you that was very wise! Great advice! Excellent advice. And, when you think about it, putting things right away doesn’t take more time…when you leave things around, you spend a lot of time putting them away later anyway. My advice for when an area gets really piled up, as our master closet sometimes does, is to approach it in baby steps. Clean up an area. Don’t just look at the entire mess and walk away because it is too overwhelming. Spend 5 or 10 minutes, and get the appreciation for one area being neat and organized again. I often find myself spending more minutes once I get started. But, knowing I only have to spend 5 or 10 minutes allows me to at least begin the process. And, now if I follow your good advice and put things away immediately, maybe our closet won’t become overwhelming to begin with! I do that, too. living in a small condo, it is a have to. FABULOUS tip Janice! You are so right about not trying to tackle the entire thing!!!! This was such a simple and true article. It’s the small steps we take every day to keep ourselves organized. Thank you. This was how I was raised, although there was a lot of stuff around everything always had a place and was returned when used. My mom’s house was always neat and clean.My husband and must start working on this to keep our place looking neat and organized, we are always looking for things. Thanks for the pretty pictures and helpful blog today.